Catcher, the loneliest position in baseball. On a sunny afternoon Brendan Lacey squats alone behind home plate staring intensely at the field. He can see the situations coming in his head. Runner on second, the pitch bounces on him he clutches the ball and then it’s automatic like a machine. Arm back, look, throw to third, got him. A wild pitch, one of the toughest plays for a catcher to handle, look routine for Lacey. He’s dealt with wilder predicaments in his life. At age four, Lacey was diagnosed with autism, a disease that can make it hard for people to communicate. He doesn’t sugar coat anything. Lacey remembers he used to have a hard time getting along with kids until he found the break through – baseball. He started playing baseball when he was young. A form of stress relief, putting bat to ball put Lacey in a zone where he could control an uncontrollable life at a young age. Hours of batting cages, dinging pitches into the mesh were all the therapy he needed. The game showed him that everyone had struggles and there were ways to beat them. “I love the ability of the game to exploit failure,” Lacey said. “The game is designed to make you fail, to make you want to give up, that’s how the good players are weeded out from the bad.” Lacey says some players hate those failures but it’s what makes the game great to him. He has seen his share of failure on the field though. “My freshman year my hitting was just bad, it ended up just taking me out of the moment all together,” he said. Lacey saw the low numbers as a message. Anyone anywhere close to Lacey will tell you this is more than true. 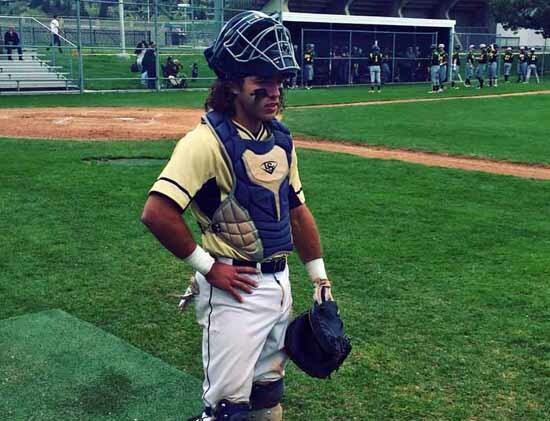 He spends the most time in the weight room, the most time on the field and in the batting cages. This is a kid who watches sports science videos for fun, shares them with his pitchers and develops the pitching strategy for the Skyline Eagles baseball team. Failures come in life too, Lacey says. He found a way – laser focus. It gives Lacey an edge that most other athletes don’t have. That’s fine by him, he’ll just keep picking them off at third. Skyline High senior Eric Jensen wrote this story as part of the Preps Utah student journalism program, powered by Bank of American Fork, which will award two of our published student journalists college scholarships at the end of the school year. Jensen is a writer for the Skyline Horizon newspaper and the proud owner/writer and editor-in-chief of www.dramaofitallasportsblog.com. He is interested in a career in journalism, specifically sports journalism. Jensen’s inspirations are Al Michaels of NBC, and Chris Wesseling, Marc Sessler, Gregg Rosenthal and Dan Hanzus of the NFL.